Draw up a Petition for Divorce. Blank forms can be obtained from an online legal document provider. On the petition, you must state your grounds for divorce. In Tennessee, this may include bigamy, addiction, criminal activity, adultery, domestic violence, impotency or desertion. 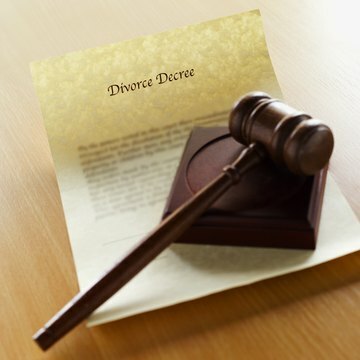 State law also provides for "no-fault" divorce on the grounds of irreconcilable differences. In order to file a Petition for Divorce, you must be a Tennessee resident for at least six months. Draw up an agreement with your spouse that includes agreed-upon terms for dividing your property and debts. Be sure to include all real estate and financial accounts. If you have minor children, you also must create a parenting plan, including a custody and visitation agreement. Also negotiate a child support agreement; make sure it is in compliance with state guidelines. Bring the Petition for Divorce and agreements to the county court in the county where you live. File the petition with the clerk of court and pay the filing fee. The clerk will date-stamp the petition, enter it into the public record and return a certified copy to you. Serve the Petition for Divorce on your spouse by hiring a private process server or submitting it to the sheriff's department in the county where your spouse lives. You must have his current work or residential address to successfully complete this step. You have 30 days from the filing date to complete service; if you are unable to meet the deadline, you may request an extension of time for service. File the proof of service, provided by the process server, with the court clerk. Your spouse has 30 days after receipt of service to file an answer, which is his response to the issues raised in your petition. Attend the hearing or mediation scheduled by the clerk of court. Tennessee law sets a minimum waiting period of 60 days from the filing of the answer if no children are involved; 90 days if children are involved. If your spouse does not file an answer to your petition, you may ask the court to enter a default judgment -- basically granting the terms of the divorce as requested in your initial filing.